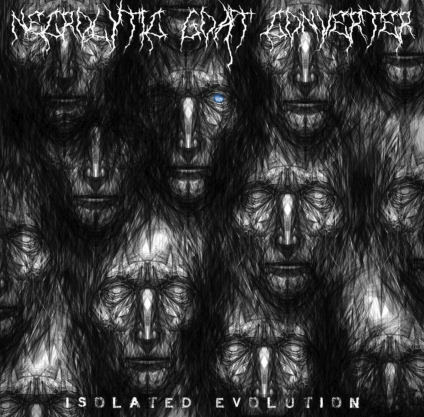 Necrolytic Goat Converter are a solo project from New York that a depressive form of black metal and death metal and this is a review of his self released 2017 album "Isolated Evolution" which will be released in August. Distorted yet melodic riffing starts off the album along with some some beats and powerful sounding bass guitars a few seconds later and after awhile high pitched depressive black metal screams start to make their presence known and the guitar leads also bring in a great amount of melody. When the music speeds up a great amount of tremolo picking and blast beats can be heard which also gives the songs a more raw black metal feeling and the songs also bring in a great mixture of slow, mid paced and fast parts and one track also adds in folk instruments and elements of Asian music. Some of the songs also mix in modern Norwegian influences and some of the tracks are very long and epic in length and a couple of the tracks also brings in a brief use of clean singing while a later song adds in acoustic guitars, psychedelic elements and 70's classic rock style guitar leads and the tracks also bring in a great amount of diversity. Necrolytic Goat Converter plays a style of depressive black metal that is very different than most bands of this genre, the production sounds very raw and heavy while the lyrics cover religion and depression themes. In my opinion Necrolytic Goat Converter are a very great sounding depressive black metal solo project and if you are a fan of this musical genre, you should check out this album. RECOMMENDED TRACKS INCLUDE "Isolated Evolution" "Seraphim" and "The Calamity Of Not Knowing". 8 out of 10.